Cannapower CBD E-liquid with Tropical Mix Aroma taste. (PG / VG: 30/70) This CBD E-liquid contains Tropical Mix Aroma of high quality. All flavors are carefully selected in the test process to match the refined taste of the hemp extract that we use. Cannapower CBD e-liquid has a 100% natural hemp flavor, unlike many others. Cannapower CBD E-Liquid Strong Menthol Aroma (PG / VG: 30/70) This CBD E-liquid contains Strong Menthol Aroma of high quality. Cannapower Natural Hemp Aroma CBD E-Liquid (PG / VG: 30/70) This CBD E-liquid contains Natural Hemp Aroma of high quality. Cannapower CBD E-Liquid (PG / VG: 30/70) This CBD E-liquid contains cactus aromas and hemp extract of high quality. 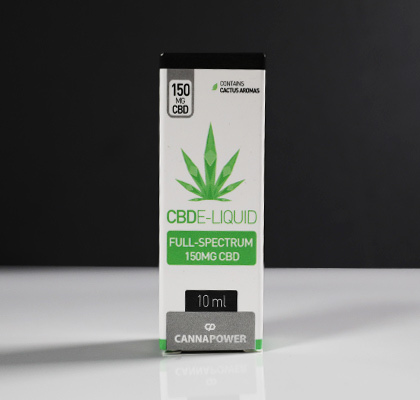 Cannapower CBD E-Liquid (PG / VG: 30/70) This CBD E-liquid contains Tea & Peach aromas and hemp extract of high quality.